The West Chester community is a growing suburb of Cincinnati that never had a downtown district. 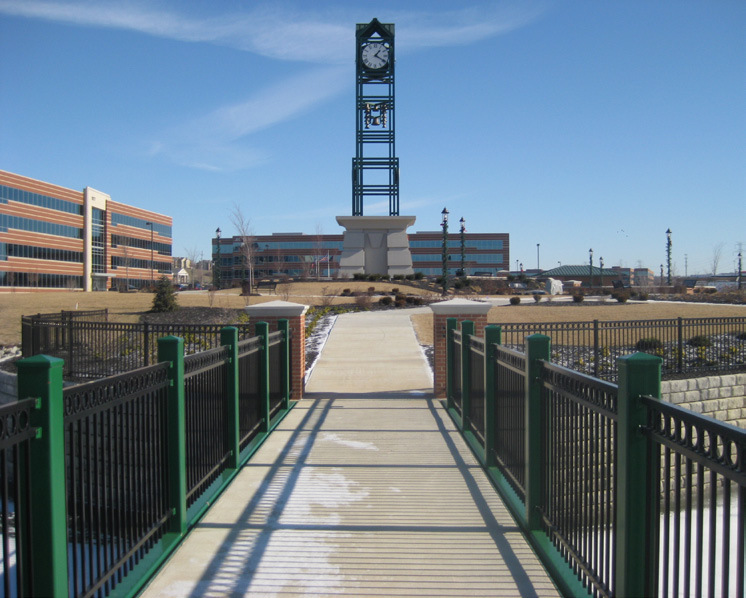 The township wanted a prominent community gathering place and hired McGill Smith Punshon, Inc. (MSP) to create the Square at Union Centre, an urban park with pedestrian walkways, fountains and a clock tower. A retention pond already existed on the park site, designed with narrow sections where a pedestrian bridge could be installed. The stackable retaining wall along one-third of its shoreline presented several design challenges for MSP when considering a new pedestrian bridge. “The retaining wall is designed to hold back the soil and not support any load. If we were to put the bridge on the typical pads, it would sit back 30’ from the waterway and would have to be over 100’ long,“ said Richard Beckman, project designer for MSP. MSP and Contech worked to design a bridge that would place the support piers in the pond away from the retaining wall foundation. This approach offered significant cost savings in addition to aesthetics. 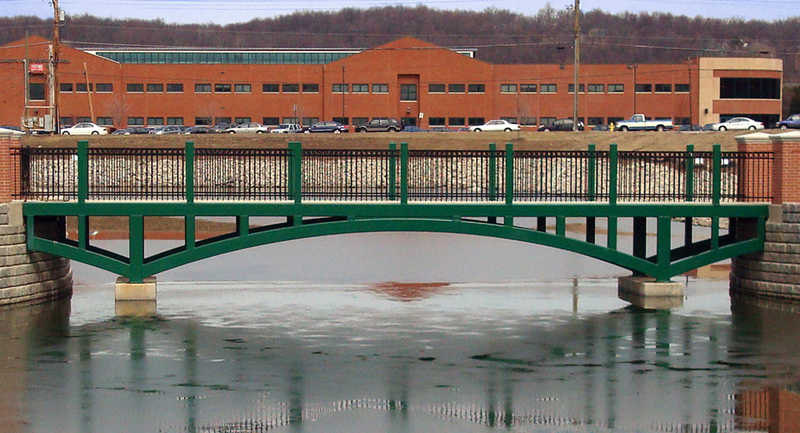 The result was a Continental® Archway style pedestrian truss bridge painted to coordinate with the clock bell tower and other park features. There are also custom posts with caps at the ends of the bridge that match the brickwork found throughout the park. 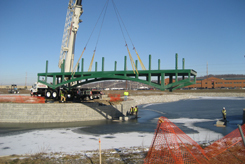 “The crane lowered the bridge onto the supports and it fit. It went well,” said Brian Burnette, SK Construction Job Supervisor. His crew was responsible for installing the new structure.